Internet users’ views about the general role of the internet in politics are mixed. Overall, people have mixed views about the internet’s influence on politics. Although many are using the internet in unprecedented numbers to learn about the election and to interact with candidates, campaigns, and other potential voters, their perceptions of the internet’s influence on politics has some negative tones. 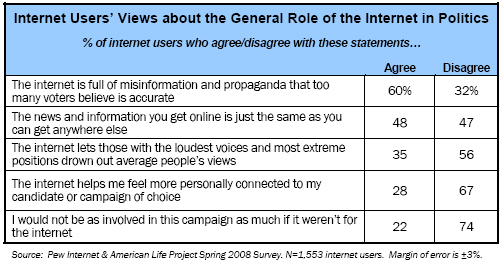 A decent share of online adults say that the internet has helped them be more involved in the campaign and feel more personally connected to their candidate of choice, yet even larger numbers feel that the internet is a megaphone for extreme viewpoints and a source of misinformation for many voters. These questions were asked of all internet users, and it is striking to see that the subset of those who are politically engaged online are more likely to have both positive and negative views than internet users who are not politically engaged. Some 64% of those who are politically engaged through the internet, email, and text messaging think the internet is full of misinformation that their fellow citizens are gullible enough to believe, compared with 54% among those who are not politically engaged online. At the same time, 37% of those who politically engaged online say the internet helps them feel more personally connected with the candidates or the campaign, compared with 13% of those who are politically disengaged. And 30% of those go online for political purposes say they would not be as involved in this election if it weren’t for the internet, compared with just 9% of the politically disengaged who say that. Among the young, though, opinions are disproportionately positive, compared with their elders. Internet users age 65 and older, by contrast, are the most likely age cohort to believe that extreme views drown out others online. Another notable difference in attitudes about the role of the internet in politics is that between those who have social networking profiles and those who don’t. Fully 42% of those who have created social networking profiles say the internet has helped them feel more personally connected to their candidate or the campaign, compared with 23% of non-profile-creators. And 30% of profile creators agree with the statement, “I would not be as involved in this campaign as much if it weren’t for the internet.” That compares to 19% of non-profile-creators. Democrats are more positive about the role of the internet. There are some partisan differences in responses to these questions about the role of the internet in politics. More online Republicans (66%) than online Democrats (58%) are likely to agree that the internet is full of misinformation that voters believe is accurate. In contrast, online Democrats are more likely to say the internet helps them feel connected to their candidates and the campaign. Some 35% of wired Democrats agree with that, compared with 24% of Republicans and 28% of independents. In contrast to online Republicans, both independents and Democrats who use the internet are more likely to agree with the statement, “I would not be as involved in this campaign as much if it weren’t for the internet.” One-quarter of online independents (26%) and Democrats (23%) subscribe to that view, versus 16% of Republicans.